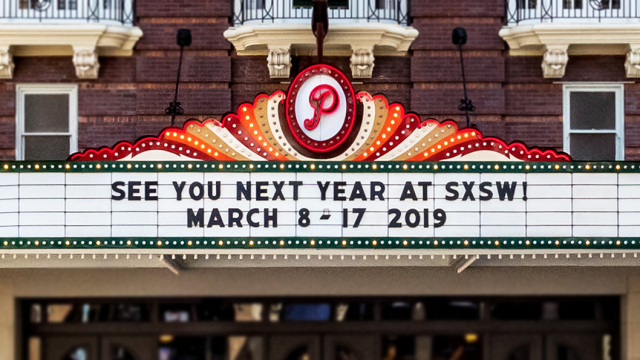 The 2018 SXSW Conference & Festivals is done and done! A big thanks to all registrants, staff, crew, volunteers, artists, speakers, filmmakers, and the Austin community. We could not have been more excited to spend a full SXSWeek of sessions, film screenings, showcases, exhibitions, tacos, networking, art, competitions, and more with you. After hearing from a multitude of creative problem solvers and visionary storytellers at the SXSW Conference, the trend Globally Connected: We’re All in this Together emerged. We also experienced enlightening talks from SXSW Keynotes – Barry Jenkins​, Esther Perel, London Mayor Sadiq Khan, and more – to compelling conversations with Featured Speakers including Jake Tapper and Bernie Sanders, Christiane Amanpour and Kara Swisher, U-God, Rian Johnson and Mark Hamill, the special event Elon Musk Answers Your Questions!, and many more. The SXSW Film Festival, celebrating its 25th year, included World Premieres of John Krasinski’s A Quiet Place, Steven Spielberg’s Ready Player One, as well as the North American Premiere of Wes Anderson’s Isle of Dogs. At the SXSW Film Festival Awards we celebrated the collaboration between filmmakers and designers honoring the winners of the 2018 Jury and Special Awards. The SXSW Music Festival turned Showcasing Artists up to 11 across all genres from local to international acts. This year’s audible feast included the North American debut concert of Max Richter’s 8-hour composition Sleep, Fluffer Pit Party featuring METZ, Nathaniel Rateliff and more at the shores, 6th annual Korea Spotlight featuring Lee Hi and KARD, and more. The Music Festival wrapped up with the announcement of the 2018 Grulke Prize winners for Developing U.S. Act, Developing Non-U.S. Act, and Career Act – Starcrawler, Jade Bird, and Todd Rundgren. The SXSW Trade Show and numerous SXSW Exhibitions brought in companies and tech from around the world, while we also celebrated the winners of the many prestigious Awards categories throughout the SXSW Interactive Festival and more. Thank you for joining us and we hope to see you next year!